The West Coast Eagles' Fijian-Australian recruit, Nic Naitanui, made an impressive debut last Saturday night at Etihad Stadium. Although the Eagles lost to Richmond (beware the club that has just replaced its coach), Naitanui was very useful in ruck and in the forward line. Taken at number two in last year's draft, the big Fijian had injury concerns to overcome before finally playing his first AFL match. His athleticism was undoubted, but the question was whether he would also have the footy skills and smarts, particularly as he is relatively new to Australian football and was not prolific in statistics in lower grades thus far. But Naitanui quickly showed what made him so sought after and has sent the Western Bulldogs to Fiji in search of similar talent. His leap at the centre bounces gave him a distinct advantage, but equally impressive was his second efforts to gain the ground ball, and his use of his height to keep his arms clear of a tackle and feed out handballs. He finished with 3 kicks, 8 handballs, 3 marks and 7 hitouts. To cap off the show he took a screamer, jumping atop three Richmond defenders to bring down a spectacular mark. Although his shot on goal hit the post it was still a fine performance. He moved and handled the ball differently to any other AFL player, and at 201 cm, with dark skin and long dreadlocks, he stands out from the crowd and is an instant cult hero. Forgive me for begging the question, but how does a player that has not had prolific statistics in the lower grades make the Under 18 All-Australian Team ? Some research here would be great. Your article makes it seem that he was picked for raw potential, but in fact he made actually made an early debut based form. What an innocuous topic to get fired up about. Naitanui missed the previous draft by just 2 days so was older than most of his competitors at the Under 18s, and being drafted at number 2 he would be expected to debut this year and become an absolute star of the competition in future. He would also be expected to be a prolific possession winner, at least in terms of ruckmen - the best now play almost as an extra onballer around the ground or if not, take a lot of marks and threaten around goal. If you had followed his career statistics as I have you would know that he has not been a prolific ball winner. But with less of a footy background than most players, and enormous athletic qualities, he was drafted a bit higher than the numbers would probably suggest, i.e. a judgement made on potential. That's a sensible decision and it was reported at the time that he would need to develop his all-round game. All those aspects quite clearly justify my implication that his potential and athleticism were unquestioned but his ability to convert that into star footballing ability was yet to be seen - most of the footy world including myself are hopeful he succeeds and his last WAFL game and his AFL debut augur well. Quoting stats from one game hardly proves your point. I do object to your occasional complaints about lack of research when you clearly had no idea what was put into a story - disagree with the conclusion but don't make unfounded statements. Brett, I'm not getting fired up, just calling it as I see it. Perhaps you should clarify the claim that Nick is "relatively new to Australian football". He's been playing the game as long as any other kid and been kicking the footy since he was a little tacker ..... in fact he first attracted the eye of talent scouts in the Under 13s ! I agree he has a reasonable background in footy - not as brief as many of the more recent basketball converts. But his family moved from Sydney to Perth and he has previously been reported in WA media as originally having a soccer and basketball background and his love of Aussie Rules growing the more he was exposed to it. To the best of my knowledge he was into the game by about 12 years of age, which I still think is a distinct disadvantage (but one which can be overcome) compared with kids that are running around with a footy from 5 to 8 when the brain is still developing rapidly and learning new skills and an innate understanding of a game is generally much easier. Maybe he was playing earlier than 12 but I haven't found anything saying so. So if that's the case then I certainly wouldn't agree that "He's been playing the game as long as any other kid and been kicking the footy since he was a little tacker". At 19, if he started at 12 then that's 7 years, compared with 14 for a kid that grows up in a footy household - imagine the headstart the younger Selwoods have had. No wonder Joel walked into the Geelong side like a seasoned pro who always knows what is going on in heavy traffic. I have dug something up to suggest Naitanui played a bit younger with the guys on his street who had their eyes fixed on the AFL (and ultimately succeeded), although Naitanui is reported as not aiming for the AFL thinking he wouldn't be good enough - perhaps that relates to him being focussed on soccer and basketball when the other kids were into footy. Perhaps "relatively new" is too vague and he was exposed to footy young, it just isn't clear when he took it up formally as his first choice. So I'm confident on your initial complaint, and concede more detail needed on your new query, anything other lines you wish to dissect? I watch WAFL footy every fortnight and over the last two years there have been some outstanding players. This is how I would rate the AFL listed and Rookie players on their years so far that started this season. 1/ Daniel Rich, from Subiaco, picked up by Brisbane no 7. 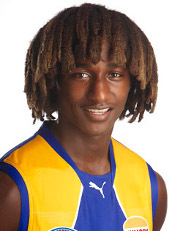 2/ Nic Naitanui, from Swan Districts, picked up by West Coast no 2. 3/ Greg Broughton, from Subiaco, picked up by Fremantle as a Rookie. 4/ Steven Hill, from West Perth, picked up by Fremantle no 3. 5/ Adam Cockie, from Subiaco, picked up by West Coast as a Rookie. I agree WA is looking pretty good. But not sure we can say they lead the way. Out of the first 20 draftees Victoria provided 20, WA 5, SA 4. Which does tell us that there is a long way to go before the rest of the states (and world) catch up to the 3 powerhouses. Lots of caveats on that of course. AFL clubs probably lean slightly more to locals, so more Victorian clubs favours slightly more Victorian draftees. And some NSW talent was accessed by the NSW scholarship scheme (but probably not more than 1 or 2 top 20's I'd guess). If we extend to top 30, it's Vic 18, WA 6, SA 5, QLD 1. In fact, if we look at just the 29 from Vic, WA and SA, then by population of those 3 states, if they produce 29 top draftees between them, we'd expect 17 from Vic, 7 from WA and 5 from SA. Pretty damn close to what eventuated - certainly within statistical error.